King of the Golden Hill: An Analysis of 50 Years of Bestsellers. So You Want Your Novel To Be a Bestseller? I looked at fifty years of the books that dominated the New York Times Adult Fiction Bestseller List, starting in 1960 and continuing through 2009. My goal was to see what kind of book got on top and stayed there, and how this has changed over time. To narrow down the massive number of titles, I focused on those which stayed on top for at least four weeks. By limiting my analyses to novels, I tossed out a handful of short story or novella collections, the graphic book, Return of the Jedi, and works under 20,000 words including Jonathan Livingston Seagull (1972) and The Christmas Box (1995). This left me with 197 novels to look at. The New York Times first began determining best-selling novels and non-fiction works on a national basis in 1942. Over the years, these lists have splintered to include competing lists. Among the categories they were divided into were paperbacks versus hardcover, print versus e-book, and children's versus adult. Sublists have been added to distinguish trade from mass-market. For these analyses, I examined the Adult Fiction Bestsellers. The methods used are described at the end of this post. A Brief Overview of Fifty Years of Bestsellers: Length of Stay on Top. During the year 2009, 37 different novels occupied the number one position, 31 of these for only one week. The average stay was 1.4 weeks. Over a remarkable period, one-week wonders climbed to the top spot for each of twenty consecutive weeks. Novels with four or more weeks at the number one position filled 47.7% of the weeks during the decade of the 2000s. If you exclude The Da Vinci Code, the Gangnam Style of novels, this number drops to 36.4%. This quick turnover has continued. The reason I did not extend this analysis into the 2010s is that so few books stayed on top for at least four weeks: so far only ten books have met this criteria. Advise and Consent and Hawaii came from a day when books were judged by their ability to blockade the cave's entrance to keep out saber-toothed tigers. Drury weighed in at 616 pages and 270,000 words, Michener at 937 pages and 460,000 words. During the 1960s the average novel* ran 463 pages and 172833 words. In the 1980s this ballooned to 554 pages and 208987 words. Of the 54 novels included in this analysis during the 1980s none were under 80,000 words. During the 2000s, the length of the average novel had dropped to half as many words: 103,880. Of the 36 novels included in this analysis for this decade, 12 had fewer than 80,000 words. *I use the term novel as shorthand to describe those included my analysis: those on top of the New York Times Adult Fiction Bestseller list for at least four weeks. Continued with Some Motley Observations. The New York Times Adult Bestseller Lists are available from the New York Times website and Wikipedia. When a book was a bestseller before and after the turn of the decade, I placed it with the decade of its printing. If it was on the list for at least four weeks in both decades I counted its presence as being in both decades. Actual word counts were available at Renaissance.com for 107 of the 196. Word counts were estimated from listening length as described below for an additional 81 of the books. This left 8 books with insufficient information to estimate word counts and these were left out of the word count analyses. Page counts: Worldcat.org was my first choice for page counts. Earliest editions were sought. Listening length. This included only unabridged, non-dramatized recordings. Most commonly these were found via Worldcat.org. On several occasions I searched through Audible.com. A database was assembled for this and a previous study which contains the listening length and actual word counts for 182 novels. These averaged 150.3 words per minute ±15.7 SDEV. The former figure was used to calculate word counts in instances where audio files were available. 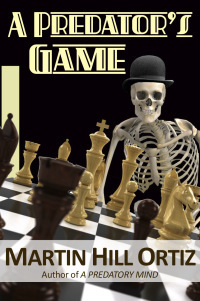 Nikola Tesla, Arthur Conan Doyle and Dr. Henry H. Holmes are all characters in my thriller, A Predator's Game. A Predator's Game is available in soft-cover and ebook editions through Amazon and other online retailers. A Predator's Game, now available, Rook's Page Publishing. King of the Golden Hill: Part Three.